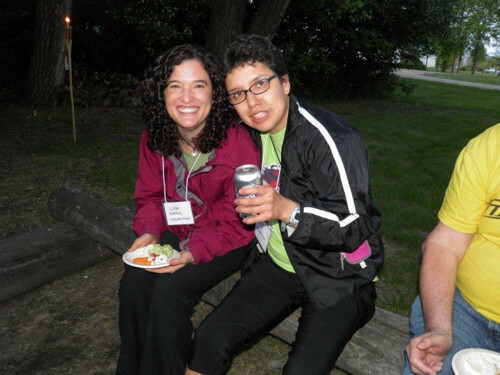 Brain injury survivors, their family members and SBIA staff enjoyed beautiful weather at this year's camp and AGM at Arlington Beach Camp and Conference Centre. "Today is beautiful. I thank God that I am still alive," said Bobby Lozinsky, as she gazed out towards the beachfront from the Kinney Lodge deck. The theme of this year's camp was treasure hunting and there were many gems of information throughout the weekend for everyone. 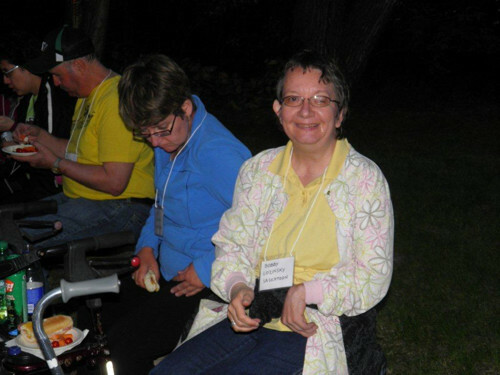 Campers and staff kicked off the weekend with a delicious marshmallow and hotdog roast on Friday evening. After an early Saturday morning breakfast, Music Therapist Bernadette Kutarna began the activities with a musical treasure treat. Bernadette explained that engaging in music creation can stimulate brain function. Various studies have suggested that brain stimulation can help speed up the recovery process for brain injury survivors. Bernadette also explained the benefits of listening to music and how it impacts our moods. The campers enjoyed playing instruments such as drums and variations of the xylophone to create harmony together at the session. Tracy Knutson gave a very inspiring and motivational group session in the afternoon, called "Dust off Your Dreams!" Tracy shared her own personal story and encouraged survivors to pursue their dreams and live to their full potential. Another treasure the campers experienced was a session by Maggie Dixon called "Finding the Storyteller in Everyone." Maggie helped the campers learn that no story is too small or unimportant to tell. She also shared helpful tips on how to make stories interesting and how to engage your audience. The campers had an opportunity to share their own personal stories at the end of the session. And of course, Maggie gave everyone a treat by sharing her own captivating and humorous stories. 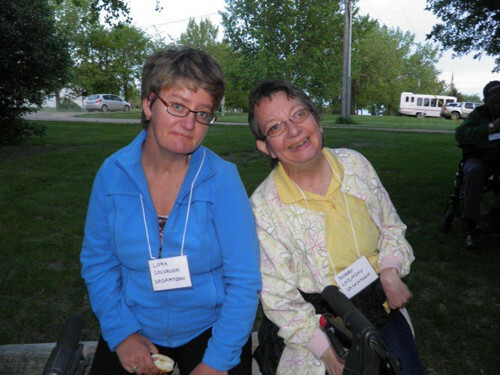 "I think things like camp are really important for survivors. 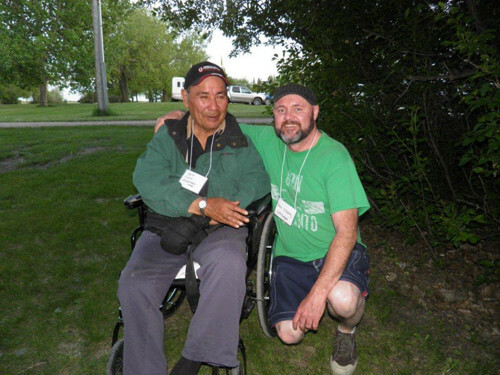 A lot of us feel isolated, but when we come together at camp we know we're not alone," said Norm Gunnlaugson of Saskatoon. The weekend was not all about fun. SBIA held its annual general meeting on Saturday evening. Gordon MacFadden was returned as the 2012-2013 President. Janine VanNess is the new chapter representative for Prince Albert. The chapter representatives for the other cities will remain the same. After the AGM, survivors and staff displayed their singing talents at Karaoke. Others participated in a crib tournament or watched the sun set on the lake. Some chose to paint a wooden treasure chest to keep as a souvenir or give to their friends and family. 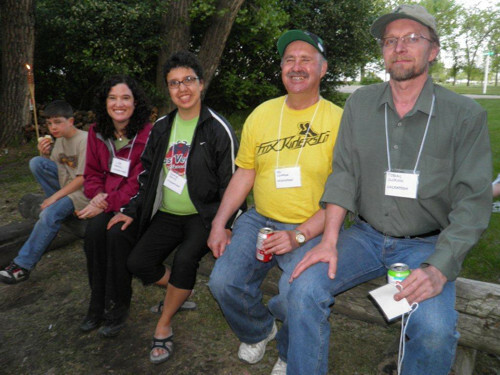 With beautiful weather, plenty of activities and the ability to for people to connect and make new friends, the 2012 SBIA camp and AGM was a weekend that will be treasured by many. SBIA would like to thank all the group session leaders and volunteers who helped make the 2012 camp weekend possible.